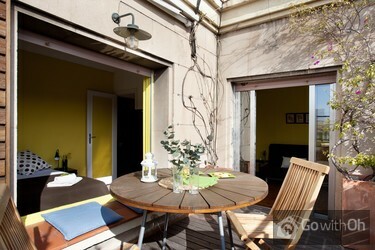 This is one of the nicest attic vacation rentals in Barcelona with a large terrace. It has been remodeled with style and is ideally suited for up to a maximum of 5 guests. 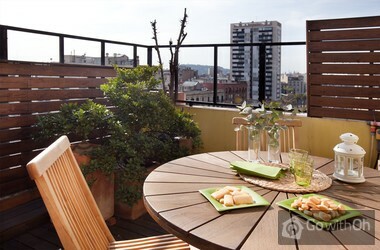 It is located on the top floor of a 7-floor building with lift in the Eixample Dret district. The flat has a living room with a dining table and a sofa-bed for two guests as well as a flat-screen television, a DVD player, a music system, and a radio. The living room opens onto the terrace with a table and chairs. The apartment boasts two bedrooms. The first opens out onto the terrace and is intended for two guests. It contains a double bed and a clothes rack. The other bedroom contains a single bed, a chest of drawers, and a built-in wardrobe where you can store all your belongings. 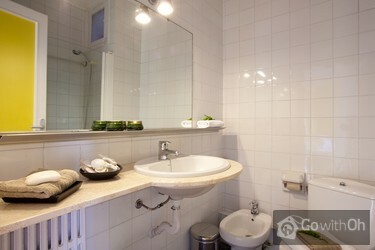 Finally, the bathroom contains a bath with shower, a washbasin, and a toilet. 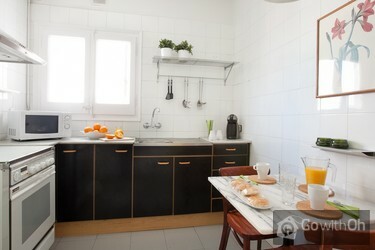 The holiday flat is located in Barcelona, very close to the center of the city, Plaça Catalunya. To reach the many places of interest that the city has to offer, you can take one of the numerous buses that travel along the Gran Via, one of Barcelonas main roads that travels from the airport on the outskirts to the very center of the city. If you prefer to take the subway, the nearest station is Tetuan. From here in just a few stops you reach Passeig de Gràcia, one of the most famous streets in the city with its many fashion boutiques. Should you not have left the holiday apartment before 11h you will be asked to leave immediately and you will be charged a surcharge of 50. 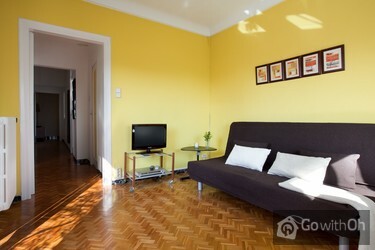 The condition of the apartment was not as nice as the pictures showed, and the heating didn't work. The owner has reviewed the heating of the apartment and has confirmed that it works correctly. They will explain how to use it on arrival of each tenant. 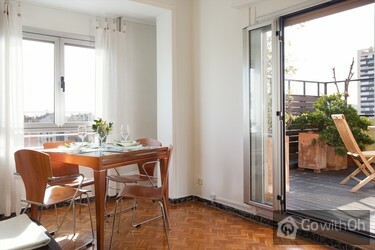 El apartamento es perfecto y todo en buen estado, muy luminoso y mucho sol, lo mejor es la terraza con vistas sobre la gran via hasta la montaña de Montjuïc . Muy céntrico y bien comunicado con metro y bus, además tiene un mercado con productos frescos en la planta baja del mismo edificio. ...La persona de contacto eficiente, atendió todas mis demandas, por ejemplo más ropa de casa. Etwas heruntergekommene Wohnung, sehr laut, zunächst keine warmen Decken vorhanden, wurden aber nachgeliefert. Wenn man wenig zu Hause ist, ok. The apartment and the location were good. The contact person was very helpful and friendly. Globalement ca allait, la propreté était moyenne (petits détails comme la poubelle de la salle de bain qui n'était pas vidée par exemple). El piso estaba muy bien y céntrico, la terrazita aunque un poco pequeña era perfecta para tomar algo y incluso para comer (unas 3 personas). En fin, un piso que recommendaria a amigos. Die Wohnung entspricht nicht ganz den Fotos aber alles in allem war sie gut und der Komfort war okay. Besonders schön war die Terrasse und hervorzuheben ist die Lage der Wohnung, wunderbar zentral und alles war prima zu erreichen. OH bestätigt hiermit, dass die Fotos aktuell sind und von einem professionellen Fotografen geschossen wurden. Somit versichern wir deren Realitätstreue. Het was een zeer prettig appartement, alles was aanwezig en het was goed schoon.. Alleen hadden we wat last van het lawaai op straat al zaten we 8 hoog, maar ja dopjes in de oren dan slaap je weer goed. Great for the price! Very very helpful and friendly contact person. Contact person is multilingual and extremly helpful. The terrace is nothing but fantastic and we used and enjoyed it very much. 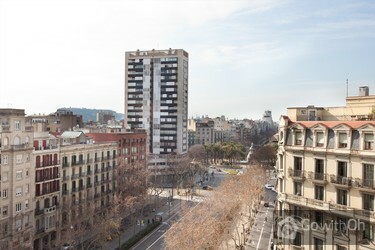 But you have to be aware of the fact, that the street in front of the appartment is one of the most frequented streets in Barcelona (6 lanes!). For this reason it is not ...very suprising that the traffic is clearyl audible at the terrace at all times. If you close all the windows and doors heading towards the street, everything turns quite, so sleeping is ok. Negative point: Besides the fact, that the bath is absolutly tiny (photo reveals that) the bathtube - not on the photo - is in very bad condition and definitly needs a new surface coating. 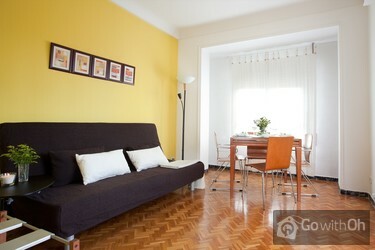 Final rating: Overall good value for the money, but next time we will chose an appartment at a less frequented street. Tutto perfetto. È stato un soggiorno bellissimo. Auf dem Dachbalkon im 7.Stock ist es viel zu laut vom Straßenlärm. Die Wohnung innen ist sehr nett und die Küche sehr gut eingerichtet. Die Lage der Wohnung zum Stadtzentrum/Altstadt ist akzeptabel - zu Fuß sind es doch 30-45 min. Bis zur nächsten Metrostation 10-15min. Supermarkt u. Bäckerei... ist gleich nebenan. Wenn man die Fenster teils geschlossen hält, ist an der Wohnung selbst nicht's auszusetzen. Die Lage und Größe der Wohnung sind perfekt. Allerdings lassen sich die Zimmertüren nicht schließen bzw. von innen nicht wieder öffnen (Gefahr des Einschließens im Bad- wir mussten einmal Blende und Klinke abschrauben, um die Tür wieder öffnen zu können).Leider geht auch der Backofen nicht.... Es fehlen Topflappen und das Kochgeschirr ist sehr wenig. Im Oktober wäre eine etwas dickere Bettdecke wünschenswert. Our flight landed early and I called the number to let them know we were on out way. There was no answer for the first 5 times I dialled - I was starting to panic but then she called me back. The guy was there with the key when we got there - although the lift was broken (not Oh-Barca's fault) and... we had to climb 7 floors. The heating wasn't on and I had to work out how the boiler worked. The electrical sockets were coming out of the walls in the main bedroom but the outdoor terrace was fabulous. I completed the pre-visit documents and made them aware of my phone number in Spain. An hour later they sent me a direct email asking for this information again - I confirmed it. When we arrived in the apartment I asked about bedding for the sofa bed and I. said he would enquire about it and get back to me. I heard nothing while we were in Spain and found some other bedding within the apartment. When I got back home there was a voicemail on my phone (my usual number) telling me there would be an additional 25E charge for the extra bedding and to confirm with them before they proceeded. They didn't use the number I had already made them aware of 3 times. It was only about bedding but it might have been needed for something more serious. Dear Guest, firstly we apologise for any inconvenience caused. We appreciate the comments you have posted and they assist us in improving the quality of our services. Unfortunately, there was a misunderstanding regarding your contact details at the time that we tried to contact you by telephone with an answer, so we sent you an email regarding your request for additional bedding for the sofa bed. We're really keen to ensure that you are entirely happy with the service we provide. One of our team members will be in touch with you shortly to see exactly how we can achieve this and hopefully we will be able to leave you with a better impression of our company. Preis/Leistung haben die ganze Familie überzeugt - insbesondere der Balkon in der 7. Etage ist klein aber fein. Accommodation had no kettle so had to boil water in a pan. Bathroom and bedroom doors did not close easily and if forced there was the risk of being stuck in the bathroom with a broken handle in one's hand. Apartment well placed for city life and within excellent transport links. Dear client, we thank you for and take into account your comments. The owner has confirmed to us that he has fixed the handle on the bathroom door. Logement correct, bien situé à deux pas d'une station de métro et à cinq minutes de la Sagrada Familia (visite de l'intérieur à ne pas rater). La personne qui nous a accueilli était très très gentille et nous a donné pleins de renseignements. appartement confortable, bon emplacement mais très bruyant. Great location - walking distance to most places! Geweldig leuk appartement op loopafstand van alle leuke plekken. De beheerder is een bijzonder aardige persoon. We komen zeker terug! Appartement agréable. Belle terrasse au dernier étage. Très bonne accessibilité par tous moyens de transports au centre ville. Station de bus à côté et métro (Tetuan) à moins de 5mn à pied. Seul bémol: le bruit ambiant de la circulation automobile. Las Toallas y la ropa para la cama faltan por todo un dia para dos personas. appartamento semplice ma funzionale, ben dotato del necessario La posizione consente di raggiungere facilmente i punti di interesse sia a piedi che coi mezzi.Gradevole la verandina della foto anche se un po' rumorosa. Unico inconveniente il sistema di avviamento dell'acqua calda. Molto gentile e disponibile la persona di contatto. Gentile Cliente, La ringraziamo per la sua recensione. Il proprietario ha confermato che la caldaia è stata aggiustata, quindi la dotazione d'acqua calda è correttamente garantita. Il proprietario ringrazia per la sua segnalazione, che permette di migliorare il servizio giorno dopo giorno. Bij aankomst was G daar om ons op te wachten. Zij was zeer vriendelijk en behulpzaam! Het appartement was erg netjes en proper. Er was wel maar 1 rolletje toiletpapier (een nieuw pak kost maar 1  in een winkeltje iets verderop hoor!) En er was een poetsproduct gebruikt (misschien voor de parket ...vloer? ) dat ongelooflijk sterk geurde.. bij het binnen komen overviel die heel sterke geur je telkens weer. Maar echt een aanrader! Top ligging ook (vlakbij metrohalte tetuan). Excellent rapport qualité-prix! Extrêmement bien situé, avec possibilité de marcher vers les sites rouristiques les plus connus ou d'accéder aux moyens de transport public. Seul petit bémol.. Le bruit de la rue.. On ferme les fenêtres..
L'appartement, très bien situé, donne un accès rapide au centre ville et proche de toutes les commodités (centre commercial, marché, taxis, bus, metro...). G., le propriétaire nous a indiqué d'excellents restaurants et donné des infos précieuses pour la logistique de notre séjour. Tout était parfait. Etwas störend war das Anspingen der Etagenheizung, die mehrmals in der Minute ansprang und das führte auch in den Schlafzimmern rund um die Uhr zu einem klackenden Geräusch. Heerlijk balkon, leuke levendige omgeving, uitstekende gastheer. Fijn appartement, erg gezellig. Goede bedden. In general the flat had been ok. however the dishes were not clean washed, the bathtube was not quite clean and on the lower surface of the bath tray there had been leavings of toothpaste from the former tenants. This had been a little bit nasty. For the final acceptance of the flat we had agreed ...that it should be done between 9.00 and 9.30 a.m. because we had to catch our flight back. As your service agent did not come during that time we called him and he mentioned that we could take a taxi then it would be time enough to reach our flight. But we already had booked and paid for the bus transer to the airport so that we had to leave the flat without the final acceptance. If a certain time window is agreed upon it should be kept! Nous sommes trés satisfaites de notre séjour. L'appartement correspondait à l'idée que nous nous en étions fait d'après l'annonce. Comme rien n'est jamais parfait, si nous devions souligner un point négatif, ce serait le bruit de la rue qui s'entend un peu de l'appartement et bien entendu de... la terrasse. l'appartement était propre et les équipements de la cuisine et de l'ensemble de l'appartement étaient trés suffisant, rien ne manquait. Je souligne également la gentillesse de la personne qui nous a accueilli et les renseignements précieux qu'elle nous a fournis (visites à ne pas manquer, restaurants...). Séjour trés positif. Appartement agréable bien situe et propre. Au milieu de tout et bien desservi par les transports. Certes un peu bruyant par le boulevard, mais la nuit cela reste correcte. Surtout après toute une journée de belles visites.Petit point négatif, pour le café du matin. Une cafetière Krups a ...capsule est fournie, mais nous n'avons pas trouvé les capsules qui allaient dedans. De ligging t.o.v. toeristische plaatsen, winkels en openbaar vervoer is super. De drukte van de weg hoor je wel goed, maar dat hebben we voor lief genomen. Een tip: maak ook gebruik van de bus. Met bus V21 ben je vanaf Monumental zo op het strand, stopt op de boulevard. Bel emplacement! Extrêmement propre. Bon pied à terre pour visiter Barcelone et ses environs. Nous avons presque tout fait à pied. Arrêt de bus et métro à proximité, lorsqu'il le faut. La terrasse (essentielle!) était notre endroit préféré pour prendre nos repas. Seul point négatif:... la climatisation déficiente qui parvenait à peine à rafraîchir l'appartement en entier puisque située dans la chambre principale. proches de tout, un peu bruyant à cause du boulevard mais c'est le seul "inconvénient"
Het appartement is goed gelegen, heel licht en gezellig en sober ingericht. Als de ramen openstaan hoor je wel het drukke verkeer van de straat beneden. Sehr zentrale Lage, verkehrsgünstig (zu Busstationen), aber auch zur Erreichung von fußläufigen Zielen. Sehr nette, kompetente und engagierte Kontaktperson. This apartment served us perfectly during our stay. 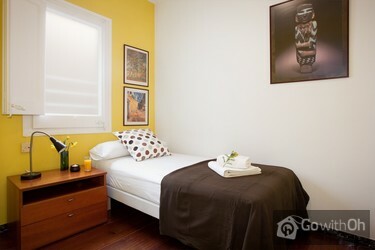 It was centrally located and comfortable with excellent facilities. We were lucky enough to have dinner on the roof terrace as the weather was so good! Dear customer, we appreciate and value your feedback. The owner confirms having reviewed the condition of the apartment to provide quality product and service to customers. Clean and spacious. Great terrace and beds. 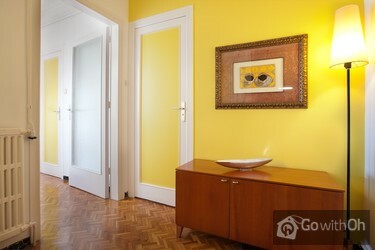 Everything you needed, 7 mins from Metro and 15 mins from Sagrada Familia on foot. The gentleman who met us at the apartment, gave us good advice to save money on travel and provided us with ideas of where to go and maps. Very much appreciated. Terrace was absolutely good thing and big enough for breakfast or lunch. The apartment was very clean. The apartment is close to the busy street so there are always something to see.Supermarkets are very close. 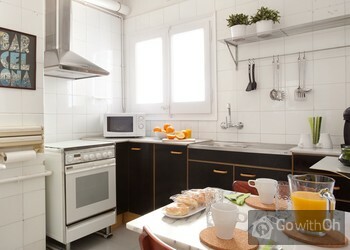 Quel bel accueil et quel bel appartement propre et lumineux.Merci à G pour tous ses conseils et bons plans.L'appartement est idéalement situé non loin de la sagrada et d'une bouche de métro. Parking juste en face. L'appartement est admirablement situé et très bien même s'il est dans un édifice plutôt vieillot.Il est cependant très chaud -- nous y étions en septembre-- et l'air climatisé annoncé sur votre site n'était, en fait, que dans une pièce, la chambre à coucher principale. Monsieur G nous a ...fournit un petit ventilateur pour la deuxième chambre, mais c'est tout de même une déception.L'odeur d'égout permanente et généralisée, nous a surpris et assez incommodés. Puis-je également signaler qu'au moment de notre séjour, tout Barcelone était imprégnée d'une odeur d'égout assez généralisée pour être incommodante. Merci, pour notre terrasse au 7ième étage, loin au-dessus de ces odeurs, même si la proximité d'un parc à chiens pouvait être incommodante : les aboiements étaient assez agaçants vers 23h00, mais ne se prolongeaient pas dans la nuit. Nous avons été très satisfaits ne notre séjour à Barcelone. Buona posizione, gentile e disponibile il proprietario. Metro e bus comodi. Unico neo: presa elettrica in camera aperta. Mooi appartement, met lift, maar ligt aan een zesbaansweg. Heel aardige behulpzame contactpersoon. Location was perfect , sitting out on the terrace was a bit noisy with traffic but we soon got used to it. The facilities within the apartment were generally in good condition but the electric sockets were coming away from the wall, so some attention is maybe needed there. The owner was excellent he... communicated with us by text and email, we were met at the apartment and given some local information that was very useful.